In the days leading up to my visit to the cinema to see Edge of Tomorrow, there was one phrase that kept appearing everywhere I looked, “Groundhog Day meets Aliens“. Being a big fan of both of those films, the prospect of a star studded, big budget mash up seemed very appealing. In what is turning out to be the norm lately, I went in with almost no knowledge of plot, but the genre cliche laden sci-fi poster along with the ominous tagline of “LIVE. DIE. REPEAT.” gave me some heads up on what to expect. The question was, would the film follow in the disappointing footsteps of something like Jumper, or would it fulfil it’s potential and succeed like, for example, Looper? On the whole I am pleased to report that Edge Of Tomorrow is a solid two hours of science fiction and action entertainment. 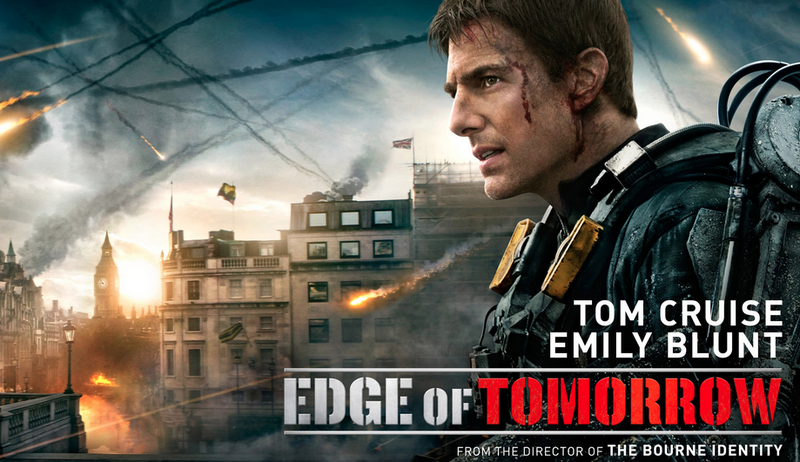 The plot revolves around Major Bill Cage (Tom Cruise), an officer in the NATO-lead United Defense Forces who appears to be the head of public relations for a war that the human race is fighting against an alien life form. Cage’s job, essentially, is to travel the world and encourage new recruits to join whilst at the same time boosting civilian moral, something he clearly does not believe in himself when, after being ordered to fight on the front line by a General named Brigham (Brendan Gleeson), he refuses to do so and is apprehended and sent regardless with the tag of deserter. Hopelessly out of his depth, Cage quickly finds himself on the beaches of France in a futuristic D-Day type battle, and almost immediately, as one would having had no training, dies. Fear not, that is not a spoiler and the film is not over, in fact, it has just become extremely interesting. Seconds later, Cage and the audience find themselves back at square one, in the yard of the military barracks in France, readying themselves for the great battle that is to take place the following morning. The rest of the film proceeds in this fashion, through means too complicated to divulge in a simple review, Cage has been granted the ability to reset the day every time he dies, and through this repeated sequence of events, is able to become more proficient in combat and, with the help of esteemed soldier Rita Vrataski (Emily Blunt), take two steps forward and one step back in an attempt to find the source of the alien power and destroy it. For a film whose narrative revolves around the repeated action of a single day, one thing that Edge Of Tomorrow can never be accused of is being boring. The imaginative, enjoyable and at times humorous ways that we see Cage perish give the feel of a frustrating but addictive video game, and though the ending in particular is somewhat muddy, there is more than enough satisfying narrative and action to forgive plot holes that, if I am honest, may just be down to my lack of understanding of the film’s fictional universe rules. It is often easy to forget, given the sometimes ridiculous nature of his private life, that Tom Cruise is a proper movie star. I mean the kind of movie star that puts you at ease whilst at the same time giving you everything you want. It is a rare talent reserved for only the biggest and the best, George Clooney, Brad Pitt etc., and I truly believe that Cruise is the godfather of them all. This is perhaps his first leading roll in which the character is not, from the start, a true hero. Watching Cruise be terrified at the prospect of military combat and work to squirm his way out of the limelight is an interesting and enjoyable juxtaposition to what the audience are used to, the flip side of the coin being that we are not surprised or cynical about the character’s credibility by the time he becomes a great fighter. Though the initial box office figures have been lower than expected for a Tom Cruise blockbuster, he proves in the film that he still up to the challenge and a much better actor than the stigma his private life garners for him. Alongside Cruise as Rita Vrataski is Emily Blunt, who gives arguably her best action performance to date. As the battle seasoned poster girl of the war, she possesses a steely, strong yet at times comically sarcastic persona that is reminiscent of Linda Hamilton’s Sarah Connor on Terminator 2: Judgment Day. Together the pair have an authentic and enjoyable chemistry that makes the inevitable romantic element a little easier to stomach. Noted supporting roles are provided by Bill Paxton, Kick Gurry, Dragomir Mrsic and Charlotte Riley, all of whom give solid performances and certainly do not get overpowered by the action or the film’s bigger names. 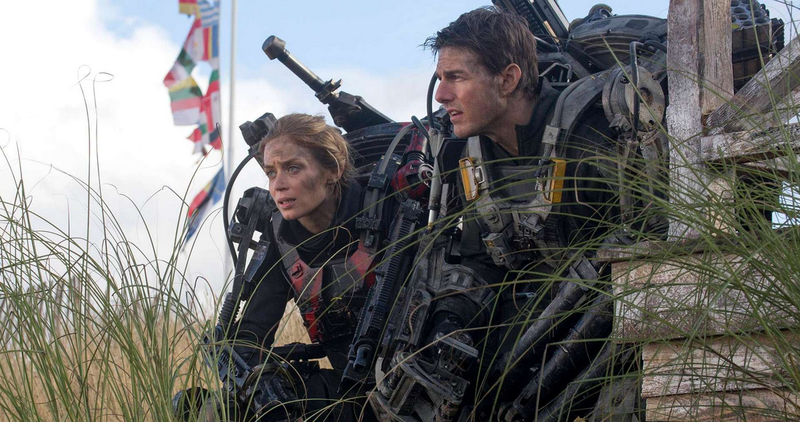 Overall, Edge Of Tomorrow was an unexpected pleasure. Though not perfect with regard to structural integrity, it is testament to my enjoyment of the film that the handful of plot holes did not detract from the fun I had whilst watching. It gives me a feeling of nostalgic comfort that Tom Cruise is still doing his own stunts and endearing audiences to whatever character he plays, and in Emily Blunt I feel a the potential for a true female action star has been born, a figure the likes of which we have not seen for a while. Nice review. It kept me entertained throughout. The only thing I didn’t like was the ending. It felt tacked on and too cheesy. Unexpected surprise is the perfect description. Lot of fun. This and Godzilla have the true blockbuster feel. I was also surprised that I enjoyed this film! It was surprisingly well-done, and entertaining as well. Amazing review, Amy. The only reason I went for it was its strong ‘word of mouth’ praise & not only was I surprised but this sci-fi actioner is for me now the finest that I’ve seen this summer.